I read Me…Jane by Patrick McDonnell when it came out in 2011 and cried at the end. I then showed it to and recommended it to almost anyone who would listen. That has to do with my feelings regarding that particular picture book, of course, but it is also a part of what has recently colored the mental environment in which I began my reading of the graphic novel Primates. I started this book with warm feelings. Primates credits Jane Goodall’s fascination with Tarzan similarly to Me…Jane, but it definitely stands out as a text appropriate for older readers, as it digs into more than the feeling behind Jane’s wanting to watch chimps, but the actual science involved, and of two other women, Dian Fossey and Biruté Galdikas, who I had only been exposed to as passing names previously. Jane did not get the bear’s share of this book, and for that I am glad. Even as I write this post, I am working in the St. Kate’s library and on the new books shelf, there is a copy of Goodall’s Seeds of Hope. She gets star billing, but Primates does a great job of showing her as a first explorer into a new territory of scientific research and how others have followed her, and how they are different. validity and truth, or the tone of it, as it helps the reader note the difference in time spent in human-human interactions versus human-primate interactions. This “voiceover” or relative quietness in the book allows for even greater impact when a lot of noise comes into play. It also means that when there is no voiceover, a lot of what is viewed by both reader and narrator is just that, viewed. A great use of the graphic format. 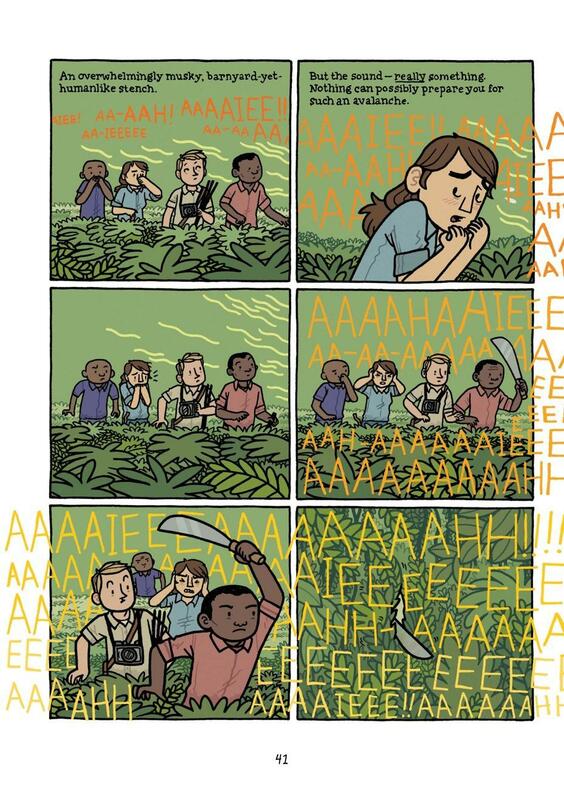 A great example of where the illustration of NOISE is used, versus human speech or narration (in first two panels). Silent observation and interaction. No text. 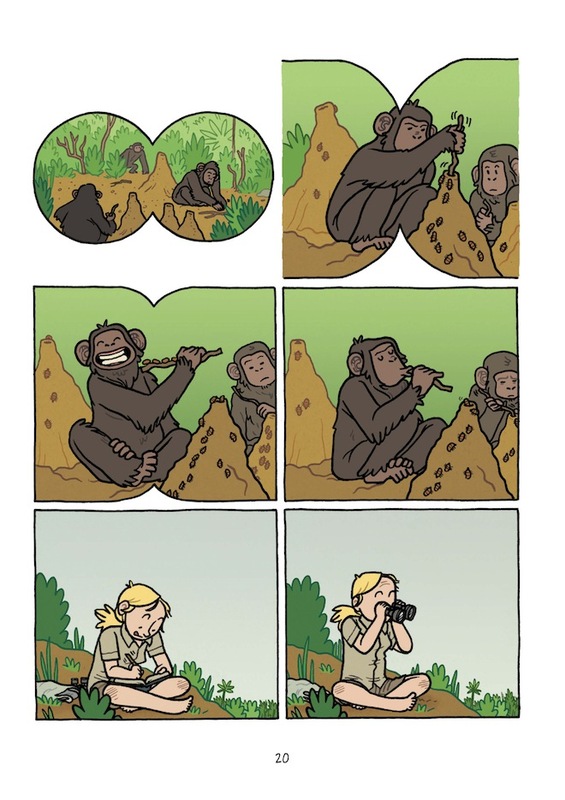 We view what Jane views (note the illustrations let us “zoom in” using the view of her binoculars as well, encouraging this connection for the reader to see through the eyes of the narrator). I had a little bit of trouble from time to time in these all-action scenes and had to re-read them in order to get a sense of what was going on – not something I often have to do in graphic-novel-reading! At first I wondered if this might be from something missing in the illustrations, but when I looked back at them right after finishing the book, they made complete sense. I feel more like I was discovering something and interpreting it, just like Jane or Dian or Biruté would have. Another great aspect this text as a graphic novels helped to illustrate (can’t help myself) is the differences between these three strong and intelligent women. They are drawn differently from each other (each has a very different style nose in particular), they each have a distinct font for their narration which also implies their generational differences as well as their level of modernity (Jane has the most formal font, Biruté the most informal). I personally loved how clear Dian’s need to protect the gorillas was, even if her fierceness (“All poachers should be hanged,” pg 129) wasn’t always terribly diplomatic towards other humans. An example of all three typefaces/handwriting used for Biruté, Dian, and Jane (text top to bottom, women pictured left to right). This feels like an incredibly flexible text regarding ages to which it might appeal. I loved it as an adult, and it makes me want to read about other women zoologists, as well as Louis Leakey, the connecting thread between these particular three women. It seems that there is a lot to learn about what was perceived and assumed regarding gender during his time, and it’s interesting to think of these women as scientist heroes but to also see that in some way they were still enabled by a male (particularly with Jane and Dian, who had less formal education than Biruté), and to read more on that in particular. The graphic format makes this book fun and easy to read for youth, particularly young adults as it goes into a level of depth beyond that of, say, Me…Jane, which is for a different audience and with a different purpose (more emotional effect than educational, although both have their parts in each text). I suspect that read with an older adult, possibly, this book would work well with grade school children as well (3rd+?). My friend Sonja’s eight year old loved it.That said, I suspect this book might appeal more to girls than to boys, given the main characters, unless the science and primate appeal can even out any middle-school fear of female protagonists. 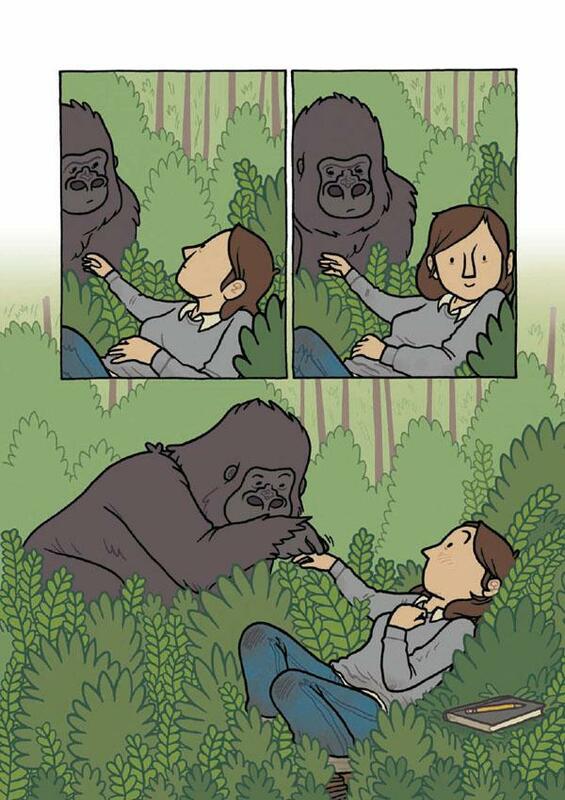 Tags: biography, Biruté Galdikas, chimpanzees, Dian Fossey, female scientists, gorillas, graphic novel, Jane Goodall, Jim Ottaviani, Maris Wicks, monkeys, orangutans, primatology, reader response, science, zoology. Bookmark the permalink.